The Oil Power Plant is a utility building that produces Power for your Sims. 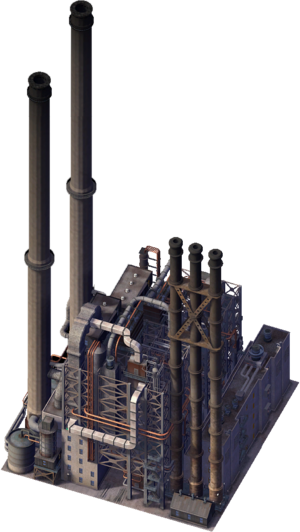 The Oil Power Plant is one of the cheapest power solutions in SimCity 4. It produces more power and less pollution with an increase in expense than the Coal Power Plant, so it can been seen as a direct upgrade, though stingy mayors may prefer to just build a Natural Gas Power Plant to supplement their existing Coal one. It is positioned between the Coal Power Plant and the Nuclear Power Plant in power production, producing more power with less pollution than the Coal Power Plant, but significantly less power with more pollution than the Nuclear Power Plant, however it's cheaper over the long term. The Oil Power Plant is also a safer power plant than Nuclear due to its smaller explosion when it reaches decommission age. This page was last modified on 30 March 2013, at 07:21.